It's a dilemma. You want to do something appropriate for the holidays, especially for those who have value to you. Defining that value is certainly the first order of business, but then, given the variables in the consideration set, do you go macro or micro? "In some cases," Steven Kaplan said, in a stirring defense for thoughtful gifts, "non-pecuniary [not cash-related] values are important." That's why the vast majority of economists in the University of Chicago's IGM poll said it's absurd to give cash to loved ones for the holidays. And it got me thinking. 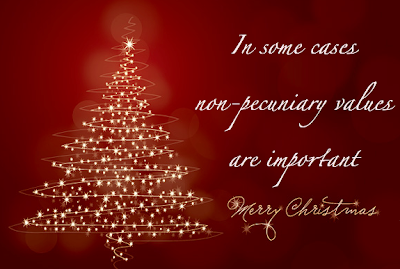 Could you design an entire set of Christmas cards from these famous economists' actual quotes to the University of Chicago? Might it make the perfect new line of season's greetings from Hallmark? Why yes, it really could. "Cash is more efficient in a narrow sense, but holiday gift exchanges are about interpersonal relationships," Joseph Altonji explained, in a card that would be perfect for, say, coaxing your long-withdrawn uncle back home for a family reunion. ... I don't know a lovelier way to troll a grandmother. Stanford's Pete Klenow's pithy explanation that "a costly signal can be worthwhile" makes the perfect card for a long-term girlfriend not-so-subtly suggesting her man buy the damn ring, already. Zales just found its new slogan. Unless Kay steals it first. Every kiss, after all, begins with a costly signal.